The Honduras Baptist Dental Mission sends mission teams of anywhere from 20 to 80 people -- half from Honduras and half from the US -- to a small town or village in Honduras about every other week. Each team operates a medical and dental brigade for 3 days, typically Monday through Wednesday. The team includes a number of licensed medical professionals from both the US and Honduras, as well as translators and general volunteers. During the 3 days that the brigade is run, about 1200 people of all ages will be seen. The locations are chosen ahead of time by our full-time, resident missionaries, who seek to assist local churches and villages. By working with pastors and community leaders, the mission advertises the dates of the brigade in advance of the teams' arrival. By the time the brigade opens on Monday morning, there are often people waiting in line to receive free medical and dental care, and hear the Gospel of Jesus. The Mission provides medical care, dental care, pharmaceuticals, eye care, Bibles and more to the people of the village or town. The Honduras Baptist Dental Mission is first and foremost a Baptist, Evangelical outreach organization, dedicated to both serving the people of Honduras for Christ and reaching the unsaved. 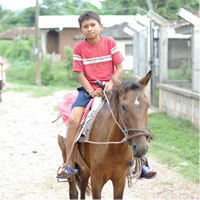 We believe Christ has called us to witness to and love the people of Honduras through what we say and what we do. We freely give the gifts of medicine, dentistry, and basic care, through the power of Christ, and the gift of the Spirit living in us. Each person seen in the brigades hears the gospel message through a church service, one-on-one interaction, or through children's church for those with little ears. 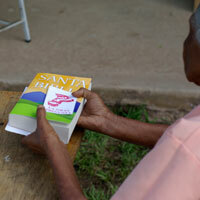 Each family receives a Bible in Spanish, and children receive New Testaments. Tracks or other materials explaining the gospel are often given and team members working the healthcare side of the brigade explain the gospel and answer questions in more detail if a patient has questions or concerns. 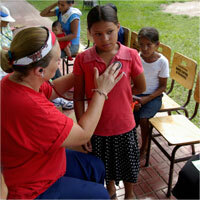 Each person seen in a brigade is provided basic medical care. A licensed medical practitioner (MD, RN, NP, or PA) examines all patients and provides any necessary treatment (such as wound care or intramuscular antibiotics) as well as medical education. Pharmaceuticals are provided for all types of basic needs, including allergies, parasites, infections, skin problems, and more. If emergency care is needed, medical practitioners provide stabilizing treatments and often work with the team captains and the full-time missionaries to decide the best way to provide care in an emergency. All services and medicine are free of charge for the patients. Patients with dental issues, most commonly tooth decay, are seen by a Honduran or American dentist. The most common dental procedure performed in the field is tooth extraction, though in some cases dentists will also perform fillings and cleanings. Patients who are farsighted are able to receive a pair of reading glasses during the brigade, and sunglasses are also available for those who work outside. Some teams may also choose to bring an eye doctor and prescription glasses for patients who need more specialized lenses than reading glasses. While not all teams provide veterinary care, it is still very much needed as the people in the rural villages of Honduras rely on animals for food, transportation, milk and other sustenance. Veterinary care most commonly consists of providing de-worming medication to horses, cows, pigs and dogs. Many teams provide for the basic needs of the families seen in brigades by giving away free food, hygiene supplies, and/or clothing after patients are seen in the healthcare side of the brigade. Families may be given 1-gallon ziplock bags containing hygiene supplies, such as toothbrushes, toothpaste, washcloths, soap, as well as toys and small gifts. Some teams also provide clothing, shoes, backpacks, and/or food (most commonly beans and rice) for the families that come to the brigades.